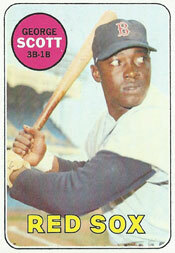 George Scott tried to psyche out Bob Gibson before Game 7 of the 1967 World Series. Naturally, it didn’t work. Instead, Gibson struck out Scott for the final out that sealed the championship for the Cardinals. In 1967, Scott, a first baseman, won the first of eight Gold Glove awards and batted .303 with 19 home runs and 82 RBI for the Red Sox. In Game 1 of the World Series, Scott had a double, single and walk against Gibson. The Cardinals ace ran the count to three balls on only one batter, Scott in the ninth inning, before walking him on a 3-and-2 pitch. In Game 4, Scott singled off Gibson. The Cardinals won both games. Brash words for a second-year big-leaguer. Gibson and the Cardinals were neither impressed nor intimidated. Instead, they were angered, motivated. Scott was wrong in his prediction that Gibson wouldn’t survive five, but the fifth inning did turn out to be memorable for both players. Leading 2-0, the Cardinals scored twice in the fifth. Gibson slugged a solo home run off starter Jim Lonborg and Roger Maris produced a sacrifice fly. Scott opened the bottom of the fifth with a triple off Gibson and scored Boston’s first run when second baseman Julian Javier, taking the relay from center fielder Curt Flood, made an errant throw trying to nail Scott at third. That was one of the few Red Sox highlights. As he had in Games 1 and 4, Gibson dominated Game 7. In the ninth, Scott came to bat with two outs. Gibson fanned him for his 10th strikeout of the game, sealing a 7-2 Cardinals victory and their second championship in four years. In three wins in the 1967 World Series, Gibson struck out 26 in 27 innings. Scott hit .231 (6-for-26) during the World Series. Against Gibson, he was 4-for-11 (.364) with a double, triple and two singles. Great timing for this story, Mark. “Boomer” was always a favorite in the Red Sox clubhouse, even during Old Timers’ Games at Fenway in the late 80s. Enjoy this year’s Fall Classic! Thanks, Rob. Always appreciate your insights as a pitcher who excelled in The Show.